If you've ever ridden a bike continuously more than an hour, you've probably experienced one or more of the above symptoms. For me (Kirk) it was always shooting pain in the left side of the neck, over-used muscles on the R outer hip, and fatigue of the quads. For Charity it was an on-going investigation of figuring out what was causing her knee pain -- saddle height, tilt, fore/aft? Or was it Cleat position? Perhaps you're a competitive cyclist or triathlete wanting to optimize your power, comfort, and aerodynamics on the bike. Not sure which crank length is ideal for you? What about Saddle? Handlebar ergonomics? Which aerobar extensions are the most comfortable? Getting Dialed in on the bike is not as easy as we would all like it to be. Really, Who has the time, $$$, or ability to figure out their absolute most ideal riding position and the components that will accommodate that position? We have invested in a state-of-the-art "Fit Bike". And, with the right fitter, this "Fit Bike" is capable of determining a rider's IDEAL position, IDEAL saddle choice, IDEAL crank length, and IDEAL Handlebar dimensions, all in just a few hours time. While pedaling, adjustments in every dimension can be made, the rider's power output monitored, and their optimal position can be determined. Planning a new bike purchase? Bike Geometries vary by manufacturer and model of bike -- Don't make the mistake of buying the wrong size or model of bike! A no-limits Bike Fit performed on our state-of-the-art “Purely Custom Fit Bike”, we leave no stone un-turned in our quest to find your absolute IDEAL position on the bike. In addition to dialing in your position, the Studio Fit also allows us to quickly find the most comfortable Saddle for your rear, the most ergonomic handlebars/aerobars/extensions for your hands and arms, and the most suitable Crank Length for your riding style. Positional changes are made while you pedal. In addition, your Power Output (in Watts) is monitored to find the perfect blend of comfort and power on the bike. 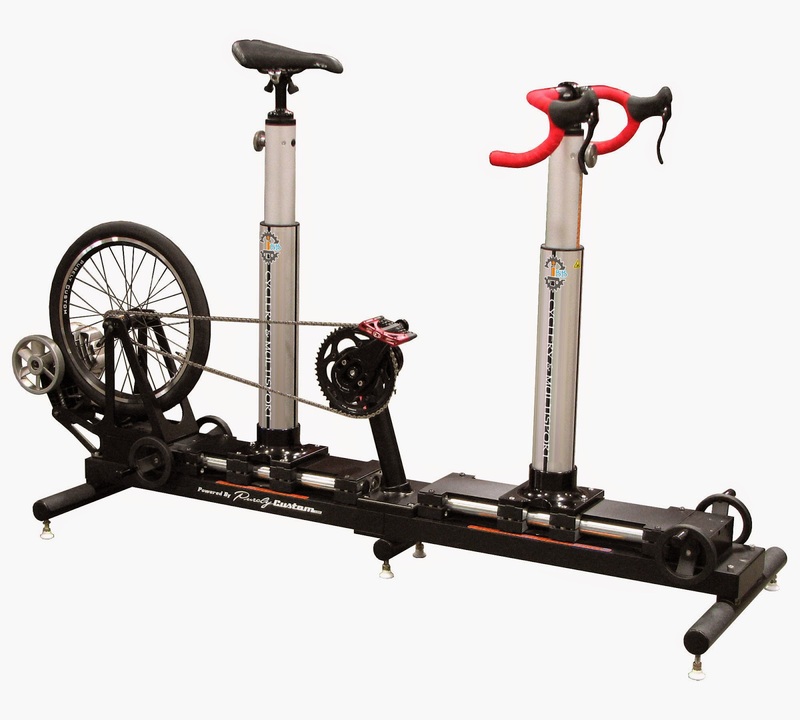 "Results" (your fit numbers) of your Studio fit can then be "applied" to your existing bike(s). Or, if you are planning a new bike purchase, your fit numbers can be used in determining the model(s) and size(s) that will accommodate your newly found "ideal" riding position (even if it's not a brand/model that we carry!). Lastly, $200 of the Studio Fit Cost may be applied toward the purchase of a new bike from us -- including both Stock and Custom-Spec Bike Options. Your bike, Riding Shorts, breathable jersey or shirt, cycling shoes with cleats, orthotics, insoles, wedges, and shims you either currently use or have used in the past. It's OK to "Price" Shop Used cars........ Don't make the mistake of Price Shopping your next Bike Fit! The truth is, very few shops offer quality bike Fits. Nowadays, most shops offer some level of bike-fitting as a service, but very few are qualified to do a Proper Bike Fit. In addition, they usually lack an understanding of cycling mechanics, usage of fitting tools, and experience. Contact us to schedule a fit or learn more. We are Giving Away one Free Studio Fit, but you must stop in to the shop to sign up!